First, thanks so much for having me at your cottage. I’ve enjoyed all the visitors you’ve had so far and I loved meeting you and your family recently. And now I’m finally here! With regards to forensic psychiatry, I left my job last March (2014) for a variety of reasons (here is a post where I explain a bit https://olganm.wordpress.com/2014/02/25/a-change-is-soon-coming/ ), partly because I wasn’t sure about my own job and about where public medicine was going (I was going to say in this country, but in reality, everywhere). I also had become very involved in writing, translating, blogging and interacting with others through social media. There were other things I wanted to do, and I felt it unlikely that any change to my job would make me content. As it happens, since I left my family circumstances changed and it was a good thing that I had the freedom to come and go. But with regards to forensic psychiatry, it’s a branch of psychiatry that looks after patients (I don’t like clients, and I’ve never been that convinced about ‘service users’ either. That seems to implied that there is choice in the matter, and in most cases that’s not true) who have had dealings with the criminal justice system, usually because they have committed crimes involving a degree of violence and/or risk to others. In some cases, patients might not have been convicted but they are felt to be too risky for an open ward or general psychiatric services. In many cases, the patients will have been tried and sent by the courts to serve the sentence in a psychiatric unit because it’s thought that they are suffering from a mental disorder. Wow! As you know, I have had a few dealings with psychiatrists in my time but fortunately not you, professionally. That sounds fascinating. 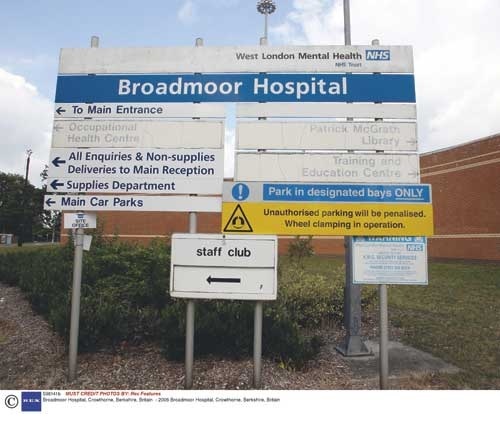 Usually forensic psychiatrists work in secure units (high, like Rampton or Broadmoor), medium or low secure (with fences around and security procedure to ensure patients do not leave and are not a risk to self or others), although sometimes they might work in prisons, or in the community, or a combination of the three. They might work together with probation officers (no longer called that, but easier to understand by that name), and provide the courts with reports with regards to the mental health state of people who are being tried. It supposes a somewhat odd combination of psychiatry and the criminal justice system and in some cases the Home Secretary (the Ministry of Justice on his behalf) has the final saying with regards to leaves, discharge, etc. 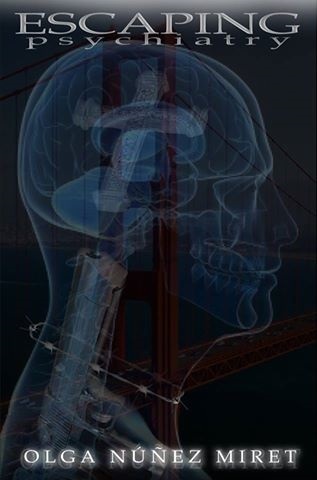 Of course due to the interaction with the Criminal Justice System, forensic psychiatry can be quite different in different places (not so much the psychiatry part, but the issue of the laws). I was working in a low-secure unit before I left, although I’ve worked in a medium secure unit and did a placement in Rampton too. And I also helped at a psychiatric clinic in a prison. Brave girl, you. I couldn’t face that. Why did you go to the UK in the first place? What kept you there? Psychiatry was the reason. I studied Medicine in Spain (University of Barcelona) but the system to specialise there was quite complicated and involved a very peculiar exam. After trying a few times, I decided to take things in my own hands and try a move to the UK, as I had relatives living in London. I thought at worst thing my English would improve a bit even if I didn’t find a job. Whilst jobs for doctors in Spain where very difficult to come by at the time (and still now, as far as I know) in the UK that was not the case and I got the first training job (in psychiatry, that was what I wanted to do) I applied for, in Eastbourne. After passing part 1 of my exam and working as a registrar in Halifax for a while, I decided I wanted to study something else because… life is too short and it’s good to give it a go. I left psychiatry and went to study American Literature full time at Sussex University (Brighton). I loved it and after the 4 years (that includes a year abroad) of the BA, I carried on a further 3 years and completed a PhD (The Films of David Mamet) and then I tried to find a job in academia. I spent a year applying everywhere but didn’t get even an interview (I was older than most candidates and with no publications or anything relevant), whilst working on locum jobs. I got tired of living out of a suitcase and decided to apply for a more permanent job. I worked in a couple of places, I took part 2 of the exam for Membership of the Royal College of Psychiatry and I carried on working. I also completed an MSc on Criminology. And then… Well, I left. I never take the straight forward path if I can help it, it seems. You translate. I know how hard that is but do tell the others because most people have no idea. We nattered on about culture and things that just “don’t fit” but I’d like you to re-iterate if you could. I’ve always translated my own stories, and that is not as complicated as trying to translate the work of others, as at least I’m sure of what I’m trying to say (most of the time!). But translating other people’s work, involves not only understanding and interpreting what they are saying, but also finding a way to make that understood in the other language. That is not always easy. We talked about proverbs, and how some are impossible to translate (there might be nothing that expresses quite the same in the other language, so sometimes you have to choose and explain the meaning, but that might not always work). Titles can be difficult. Translating an expression literally might change greatly the meaning of a sentence. And things like translating words that might have a double meaning in the original, can be very complicated, as it is unlikely that will be the case with the word in the other language. I remember talking to a writer who translates to French and he noted how complex it is to translate humour and comedy, as the best tends to rely heavily on double meaning and a very precise use of words. We also have to contend with peculiar grammatical constructions that might not work in another language, and it’s another judgement call what to do. I remember very well how when I started working in the UK I would sometimes start to say something in English but using a Spanish grammatical construction, and realise half way through that it would not work and I’d have to start again. Depending on the kind of book it is, there might be issues of localisation (change names, make situations or circumstances more understandable to the public or try to find an equivalent that might be better understood due to cultural differences). I so agree! Translating word-for-word seldom works and humour? I have two heads, with my French one on I can find a joke hilarious but with my English one it is naff! We are going on here, Olga. Here is Badger with some ice-cold Coca Cola and tapas. Let’s have a break and continue talking about your own writing tomorrow. I’m loving re-living our meet-up in Barcelona! 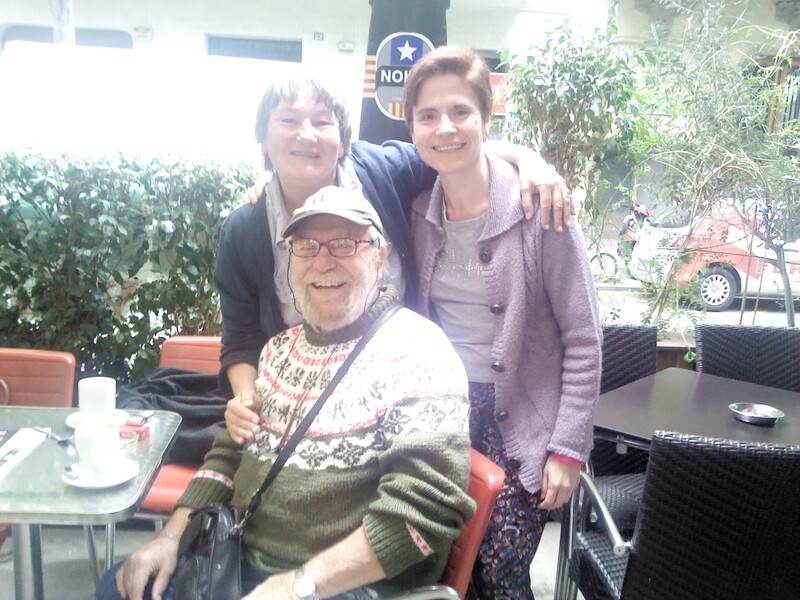 Lovely interview with Olga, Ailsa, and I’m so jealous you’ve managed to meet up! Thanks so much to Ailsa Abraham Author​ for having me as a guest! If you haven’t met her yet, go over and visit! Great interview with Olga, I was interested to read that she studied American Literature at Sussex University in Brighton, my daughter is currently there studying English Literature. What an impressive career you’ve had, Olga. You are so right about translating idioms, proverbs and humour. It is very, very hard. It was lovely to ‘meet’ you! How nice to see Olga here. You brought out some interesting perspectives. Hugs! So great to learn more about Olga! Thanks for this great interview! Interesting interview. Re patients/consumers, clients: You don’t have to go very far to see a similar degradation of language: Prisons, penitentaries, correctional facilities. Prisoner, inmate. It pervades modern politically correct bureaucracies. The great american comedian, George Carlin, was a master at observing the softening of words. Tell me, did you work for a hospital, a medical center, or a health center? This was so fascinating to read. Great interview questions, Ailsa and Olga I am overly impressed with your fascinating background. It’s so nice to get to know more about fellow bloggers. Thanks so much for the comments. My life… well, I’m sure you know the saying about not changing horses in mid-stream. I guess I don’t. I will always be interested in psychiatry, but my preference (if I can) would be to be involved in a voluntary capacity, rather than have to be linked to an institution but we’ll see. I agree on the comments about language. And I hope Sussex is good for your daughter marjma2014. Thanks for all the love and thanks again, Ailsa.